Good Morning by Tamarind joined the original Tamarind Guesthouse in 2014 to start a little accommodation empire by the friendly Tamarind crew. Average rating 8.7 from 1,242 reviews. It’s a great choice for backpackers of all ages who appreciate comfort and quiet. 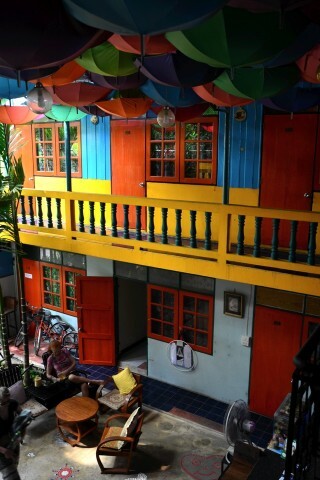 Set down a side lane marked by a sign off Naresuan Road, about halfway between the Historical Park and Soi Farang, Good Morning greets you with a partially open-air common room topped by countless colourful umbrellas adorning the high ceiling. A second, upstairs common area features a shared fridge, complimentary coffee/tea and fruit, and a bunch of good info on train and bus times. Helpful staffers provide tour and transport bookings and rent out bicycles and motorbikes. The free WiFi worked great for us. Done up in bright primary colours and with plenty of space, rooms are situated on either side of the building, accessed by corridors that are open on one side. Front windows face back into the centre of the building and the pink curtains do let some light through, but the staff darkens the place up at around 23:00. You can expect quiet nights and comfy beds with soft linens. While the rooms don’t achieve the stylish quality of Tamarind Guesthouse, they do come with desks, silk-shaded lamps and small back porches accessed through doors topped by amber stained-glass windows. Doors and floors are fairly old but air-con units are newish and rooms well kept, with plenty of space in the hot-water wet bathrooms. Though they lack the character of Good Morning, the nearby Phrakhun House and Grandparent’s Home are both solid air-con alternatives with roughly the same rates. Check rates at Good Morning by Tamarind on Booking.com.